Atlantic Beach, NC Bojangles'® Tands, INC. Store #45 - Bojangles'® / Tands, Inc. If you’re headed to the beach, it’s Bo Time! Our Atlantic Beach Bojangles’® is located less than 500 ft from the beach. Swing by and fuel up for a day of fun in the sun and sand, or you can grab a Big Bo Box to feed the whole group with a beach picnic. Nothing will fill you up quite like Bojangles’® fried chicken and biscuits, and nothing is quite as refreshing as a gulp of our Legendary Iced Tea®. 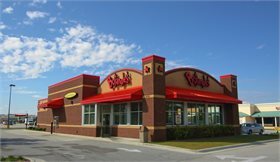 Atlantic Beach loves the southern food and fast, friendly service at Bojangles’®! For breakfast, lunch or dinner, Bojangles’® has the food the whole family will love.